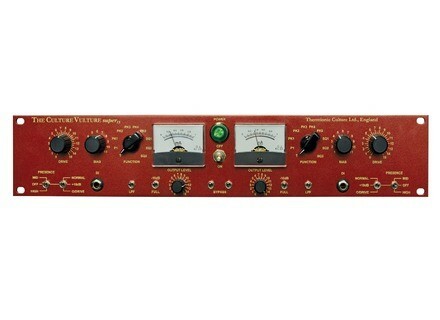 The Culture Vulture Super 15, Other Studio Effect from Thermionic Culture. For the 15th Anniversary celebration, Thermionic Culture releases the HG 15 version of its Phoenix mono compressor and the famous Culture Vulture valve enhancer/distortion unit in Super 15 version. They are not simple replicas of previous versions, but updated modules. The Phoenix HG 15 uses a 6AQ8EH tube on the input, which allows for higher gain, thicker compression and reduced noise. The gain increases from 28dB to 53dB, which allows for using most of the condenser microphones, along with the included phantom power. Other new feature is a basic EQ with bass cut, presence and Air. Last, inputs and outputs are Sowter transformer-balanced. On the Culture Vulture Super 15, Thermionic Culture has added a third +10dB option to the Drive switch, located between Normal and Overdrive positions. This options allows for a crunchier sound with more brilliance. The Drive knob max value now reaches 15 and the Function switch received an adjustable dynamic mid-lift for the P positions and drastically-processed harmonics for the SQ positions. The unit also features a presence switch, just like the Solo Vulture model and -10dB pads complete the output level controls. They can be used with the Drive +10dB for comparisons. Last, this version uses military-grade NOS tubes. US list prices are $2599 for the Phoenix HG 15 and $2999 for the Culture Vulture Super 15. Both modules are expected in June. Royer Labs celebrates its 15th anniversary Royer Labs was founded in 1998 and celebrates this year its 15th anniversary with a limited edition R-121 microphone. How to Set Up a Compressor A compressor basically serves to reduce signal dynamics, that is to say the difference between loud and quiet signal parts. Free Roland M-300 Remote app for iPad Roland announced the release of the M-300 Remote control app for the M-300 V-Mixer digital mixers from the iPad.